As Andy mentioned in the previous blog, it was hard to decide when I was ready to get back on the road. We both knew it was more a matter of when rather than if as my family had always been 100% behind the trip and I couldn’t let my lovely husband down, plus of course I also wanted to continue. We decided a date that worked and off we went again. Cambodia is another country that neither Andy nor I had visited before. We were excited to see what it was like. When we arrived it was quite late at night but didn’t feel unbearably hot but in the midday sun it was quite a different story. 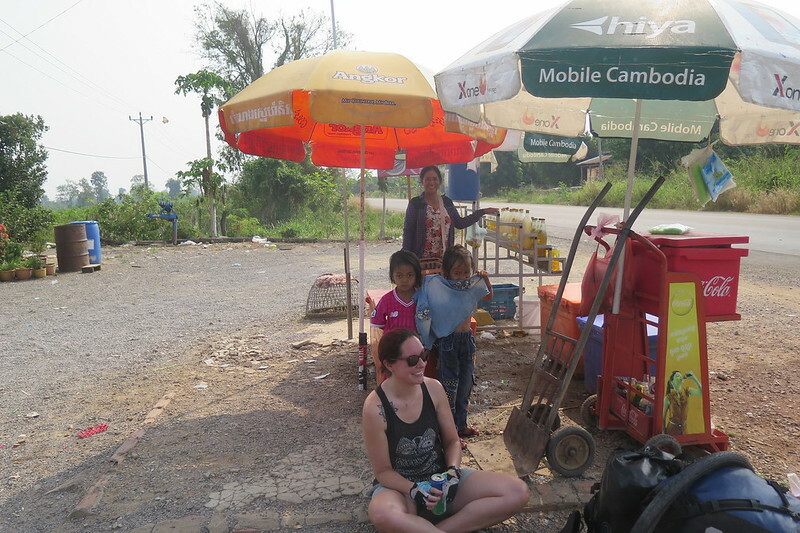 Whilst we were doing the touristy things in Siem Reap with unloaded bikes it wasn’t too bad but once we left it was a little harder to adjust. 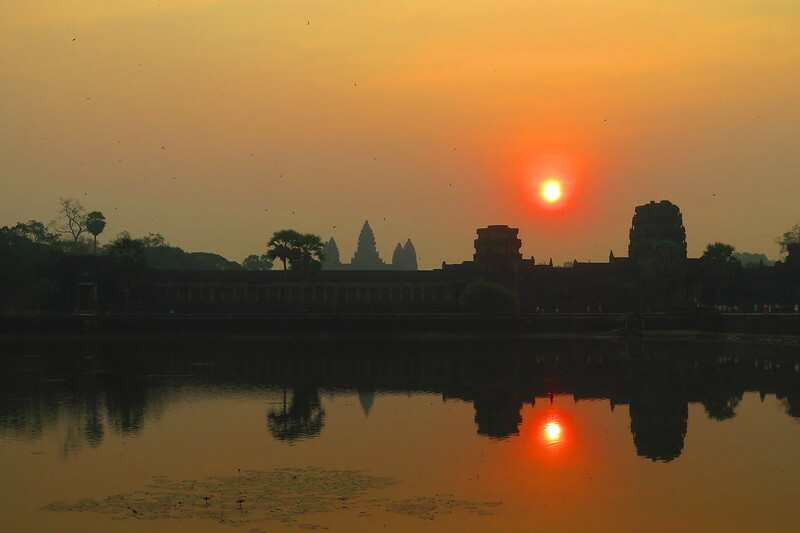 It was a great start to be seeing the sights of Angkor Wat. An absolutely beautiful place that we managed to do at a good pace, so we didn’t become too ‘templed out’. We also had a few fun nights out eating and drinking with Todd and Vicky, an added bonus. It also meant we were on tourist prices and with only just getting back from the UK it meant we weren’t very strict with budgeting! Oops. Oh well it was extremely fun and a nice way to get back into things. 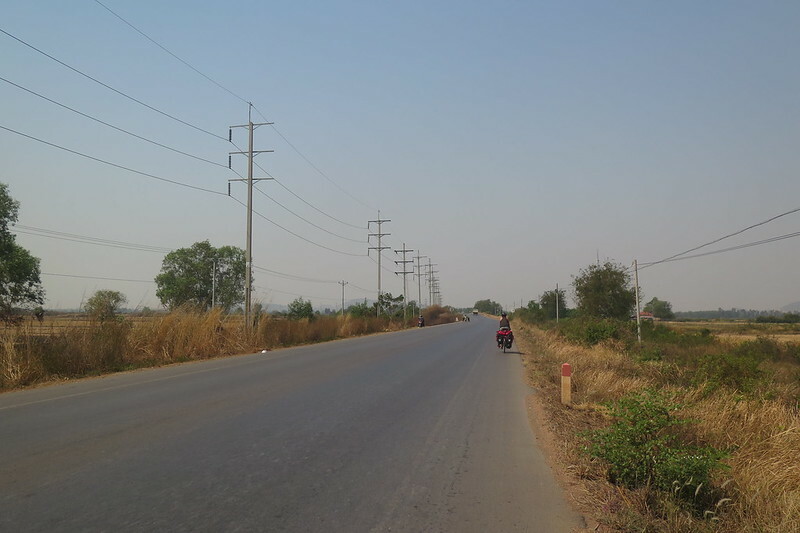 Once we finally got moving, heading towards Battambang, things changed. We set off at 10am the first day and it was already pretty hot. Once out of the city it was a fairly boring, dusty road with no cover. We were only starting off with 50 odd kms but it was a hard day and I was questioning what on earth we were doing. We at least learnt to leave as early as possible but I think we both didn’t really enjoy the riding in Cambodia. Maybe at a different time of year it would be more interesting. 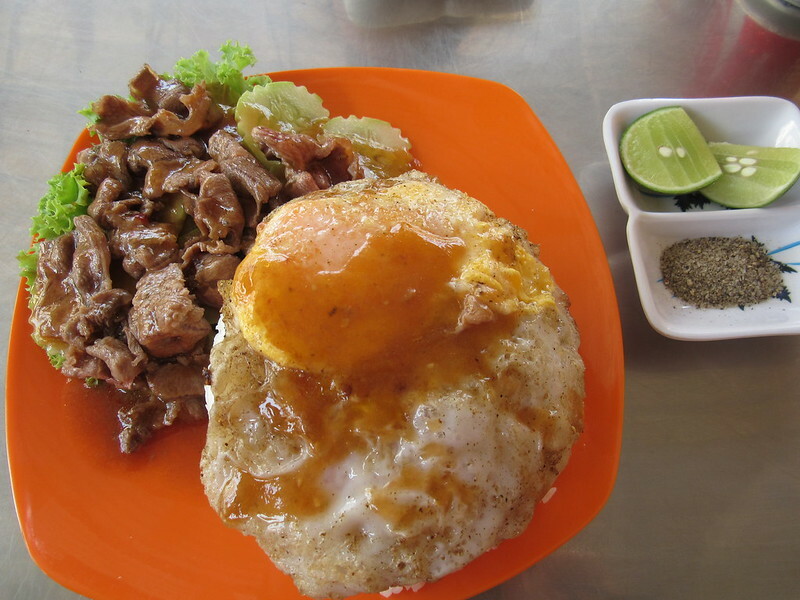 It was good to visit a few different towns on our travel though, and the food we ate was all pretty delicious. Our trip to the bat caves in Battambang was pretty crazy. A million bats all flying out at dusk. 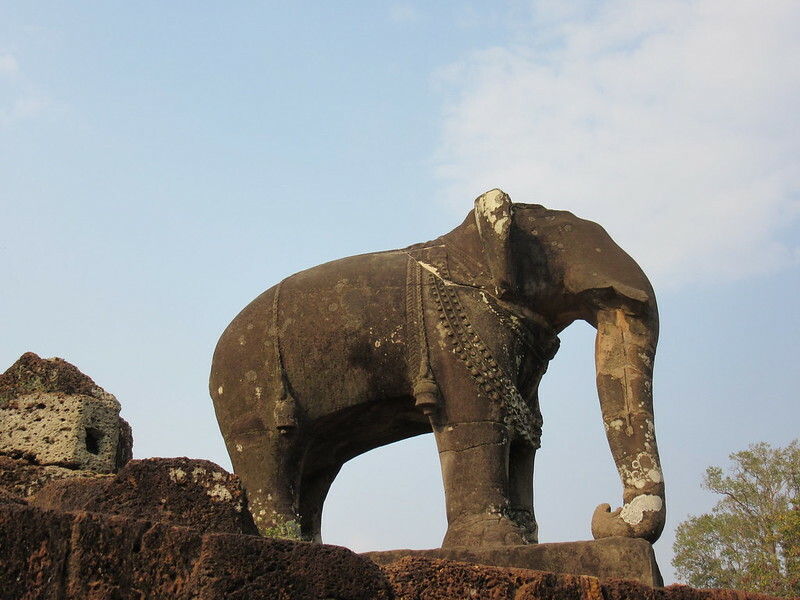 I would say Cambodia is relatively new on the tourist trail, in comparison to Thailand and Vietnam, and with that I feel a lot of people were out to make a buck, understandably. For me being a woman I felt ignored by people most of the time as they assume it’s the man that has the money. I was pretty much never addressed, people would always talk to Andy. This can be common in many Asian countries and I’m sure Western too but it took away from my experience of interacting with people. The Khmer people have had a horrible history most recently being the Khmer Rogue and I don’t doubt it has been an extremely tough time since for people to readjust. There are a large number of young people now who are struggling to find work with not many jobs, others who balance numerous jobs to make a decent salary, it’s a hard existence. We found people restrained but I’m sure we didn’t spend enough time there to fully understand. On the other side, the children were adorable and somehow always seemed to spot us on the road and shout in their loudest voices, ‘hello, hello!’ There seemed to be no prompting, cycling through some small towns/villages I wonder how many foreigners they’ve seen and why they shout hello to them. It was some times the little boost needed to keep on pedalling. Overall we did enjoy our time in Cambodia (just not some of the cycling). I’m glad we managed to fit it in to the trip. Angkor Wat was the highlight for me, and the fruit shakes. NB – Even though I had always said the trip wasn’t to raise money for a particular charity, if you think all the sweat, effort and tears (mostly Andy of course) is worth a donation we would greatly appreciate that it went directly to cancer research http://www.cancerresearchuk.org sadly it affects too many people. So good to see you writing too Clare. the link to cancer research didnt work for me, so i’ll leave this here for anyone else that wants it.